Mulvaney is Trump’s Budget Director. 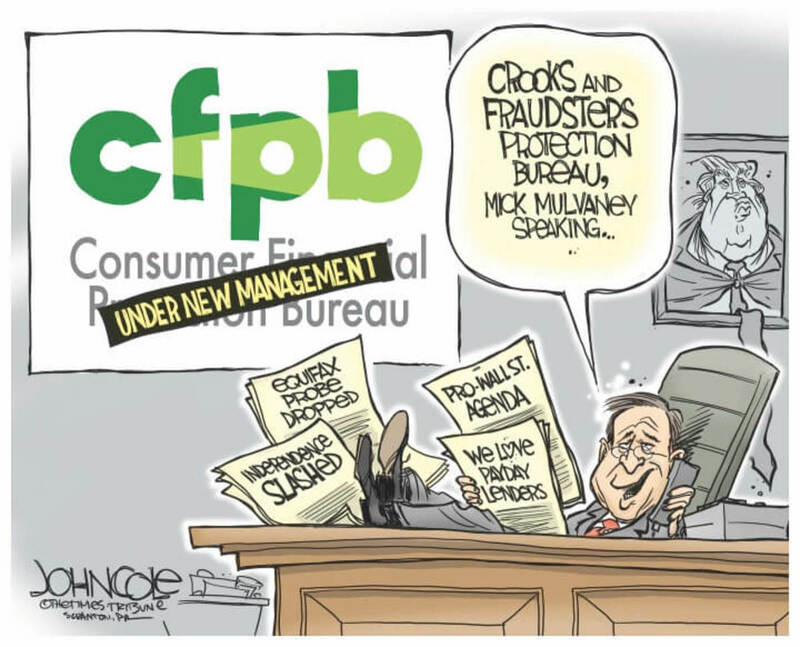 He is also doing double-duty as head of the Consumer Financial Protection Bureau (CFPB), the agency created under President Obama to protect consumers from being ripped off by predatory and criminally-inclined banks. The bill Mulvaney helped engineer netted the country’s six largest banks an estimated $3.6 billion in tax giveaways last quarter alone, according to the Associated Press. Their further enrichment is all but assured, now that Mulvaney has put a freeze on hiring and suspended rule-making at the agency. Enforcement actions are at a standstill. Mulvaney has been very kind to the payday lending industry, an especially predatory form of capitalism that preys on lower-income and minority communities. The industry specializes in luring customers into repeated short-term loans at rates that can exceed 400 percent annually. The CFPB had proposed rules to rein in this legalized usury, and Mulvaney is doing everything in his power to stop the implementation of those rules.